Blog Why Does My Dog Pee When She Gets Excited? Dogs pee to eliminate liquid waste from their bodies, but sometimes they pee due to over stimulation and a conditioned behavior which can happen at inconvenient times – and be quite messy. From submissive peeing to excitement peeing, pups can let their bladders loose for a variety of reasons. Learning to recognize and combat the canine conundrum can be a little tricky. If you have a dog that when approached by people or other dogs starts to pee and ends up flopping over and rolling in it – then you have a submissive urinator. When a dog shows you their belly especially upon greeting they are saying, “I am no threat! I mean no harm and am taking the first bow”. The problem here is that your pooch is ending up in their piddle, which means its on them and whatever surface they are on – such as your living room carpet. To subside submissive peeing it is best done in increments. Your dog has been rewarded for the peeing and submitting because when they do it, they receive attention. So first thing first is to prevent the the behavior and condition a new one. Start by reinforcing their sit, or if they didn’t have one to begin with, teaching a strong sit. Once the sit is steady you will need to enlist some other human help. Ask friends to stop by and when your dog rushes them have them ignore her. Wait until she either sits or is calm enough to take a treat and then sit. If he or she goes to roll and let their bladder go, have your friend walk away or even back out of the house. The ultimate goal is to condition your pup through positive reinforcement training that the resulting behavior that gets the reward is holding your pee pee and going into a good sit. This can take time and several mini training sessions. The most important is reinforcing the foundation sit. You can also train them to look at your or some other motion that detracts their excitement from the human or dog entering and distracts them from draining their bladder. I personally tackled this tinkle nightmare for a good several months with my male Boxer. To this day when he sees his breeder he still excitement pees, despite being 5! But do not fear, that is mostly because his breeder does not follow our no-excitement protocol and gets him going the second they lock eyes. We now just meet her outside and let his pee pour. For the regular Rex, this can be an issue of age or like our belly flopping puddle-jumping pup mentioned above; a behavioral trend that can be broken. If your dog is young, say under 12 months of age this issue should dry up but you can help it along. If your pup is older, you might be battling a behavior that just needs to be reconditioned. First and foremost remove the stimuli to then work on the desired behavior. If excitement from people or other dogs gets the water gates gushing then stop all exposure to such things, at least in your house. Excitement peeing outside is not desirable but its inside that is causing the human issue. You might want to try your first exposure back to exciting stimuli outside but ultimately you don’t want them excitedly expressing their bladder inside or out! Like mentioned above, have your dog in a sit, or as many call it, “a sit for pets”; meaning when a human approaches, your dog’s bum should remain down. First reinforce the sit. Then slowly add in people. As they approach if your dog loses concentration on keeping their tushie tight to the ground, send the visiting human away and keep trying in small increments. Keep the energy level low and calm. For most young dogs this is a normal phase that with little or no training they grow out of. As their bladder control grows so does their ability to handle excitement. Either way, teaching your dog to be a good citizen when others approach is always recommended – keeping their tails tied to the floor is an excellent behavior to have. Stopping the stimulating stream takes some patience but it will pay off in the end. Teaching a strong sit is one of the easiest ways but really any re-directive behavior can help. Teach your submissive pup to give paw or your excited guy to go get a toy. Any behavior that turns their focus away from what makes them pee is perfect. If you are still having trouble tackling the tinkles then talk to your veterinarian, peeing Penny could have a medical condition so it is always good to get that checked out. If your dog suddenly starts this behavior or you recognize something else is off, take the steps to know what to do. 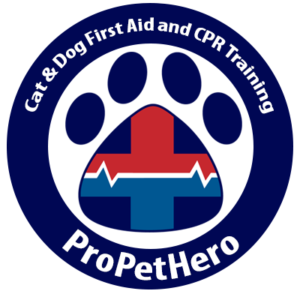 Learn pet first aid & CPR so you know how to best react for your pup. Thanks for the article. 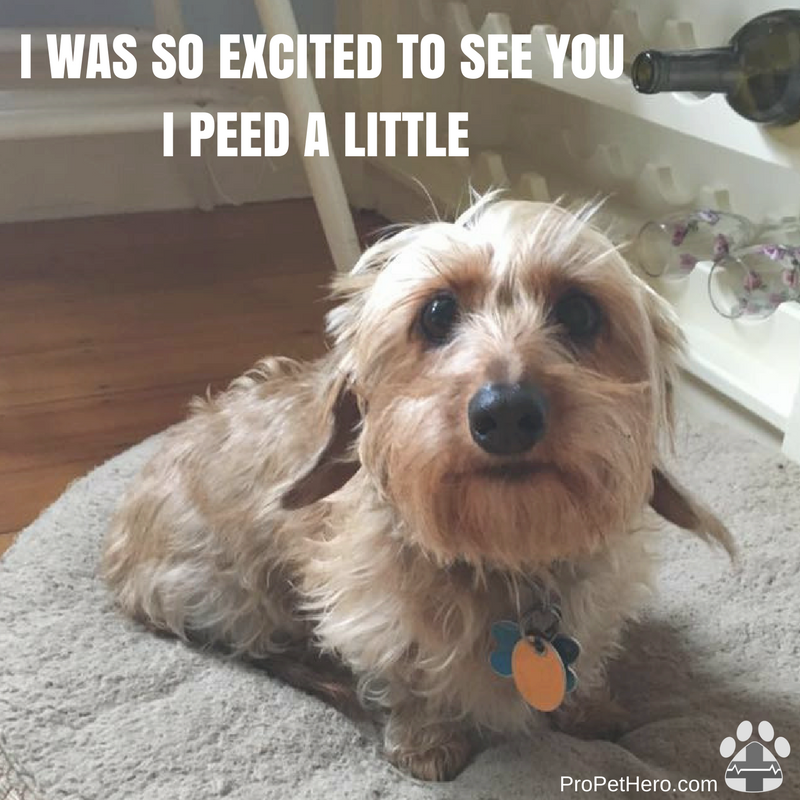 For the longest time we were dealing with the ‘excitement pee’ with our dog. We finally realized that it was partly our fault for being excited to see him when we came home after being gone a while. A lot of puppy accidents and carpet cleanings from Acme Chem-Dry later, we finally have our dog holding it in when he gets excited!